For the painting, see A Bigger Splash. 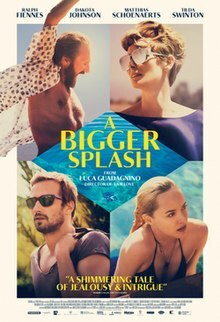 A Bigger Splash is a 2015 Italian drama film directed by Luca Guadagnino and written by Alain Page and David Kajganich. Loosely based on the 1969 Jacques Deray film La Piscine and named after the David Hockney painting, the film stars Tilda Swinton, Matthias Schoenaerts, Ralph Fiennes, and Dakota Johnson. It is the second installment in Guadagnino's self-described Desire trilogy, following I Am Love (2009) and preceding Call Me by Your Name (2017). It competed for the Golden Lion at the 72nd Venice International Film Festival. In an isolated villa on the small Italian island of Pantelleria, world-famous rock singer Marianne Lane is on holiday with her filmmaker lover Paul. She is recovering from surgery and has lost her voice, communicating only by signs and occasional whispers. He is in recovery from alcohol addiction and a suicide attempt. Neither speaks Italian but solitude is what both need, until an aeroplane from Rome brings a man neither wants to see. This is Harry, an extroverted music promoter who was Marianne's lover until he passed her on to his protegé, Paul. With him is Penelope (Pen), a previously unknown daughter of his who says she is 22. Moving into the villa, Harry starts inviting friends around as if it were his home and taking everybody out to various sights and festivities. His arrogant manner bores Pen and annoys Paul, but Marianne starts falling under his spell again; however, when Harry and Marianne begin to become intimate while alone, Marianne stops Harry. She tells him that she does love him, but that she cannot be with him and that she is with Paul. The sultry Pen then makes a play for the unhappy Paul; it is not shown, but implied, that Paul succumbs to Pen's overtures. After drinking on his own, Harry comes back very late and starts a fight beside the pool with Paul. Both fall in, and the fight continues. Paul holds Harry underwater too long, and Harry drowns. Realizing his mistake, Paul pulls Harry to the surface and attempts to resuscitate him, but is unsuccessful and leaves Harry to drift to the bottom of the pool. In the morning his corpse is seen by the maid, who calls the police. They have more urgent business with illegal immigrants landing from North Africa, some floating ashore dead, but take the occupants of the villa in for questioning. Marianne convinces them with the truth that she was asleep, and suggests that the murderer was an intruder. Paul lies, saying he went to bed before the time of death, and is believed. Pen reveals that she can speak perfect Italian, but chose to let her hosts struggle, and her passport reveals that she is only 17. Paul is concerned that Pen may have witnessed his fight with Harry in the pool, but is unable to determine how much she knows, if anything. Paul tearfully admits to Marianne that he killed Harry but tried to save him. Taking her to the airport, at the departure gate, Pen makes a statement which references something Marianne once said to Harry. Visibly disturbed, Marianne slaps Pen. Pen maintains her composure until she is shown boarding the plane in tears unseen by Marianne and Paul who depart in their car. On the ride back to the villa, they are stopped by the police. It is the investigating officer, but rather than pursuing the case he reveals himself to be a fan of Marianne and wants her to autograph a CD. She obliges and returns to the car where she and Paul share their relief and drive away. The first promo still of A Bigger Splash featuring Matthias Schoenaerts, Tilda Swinton, Dakota Johnson and Ralph Fiennes was released on 27 July 2015. A new set of movie stills were released on 3 September 2015. The first clip was released on 5 September 2015. Tilda Swinton appeared in-character on the cover of the Autumn/Winter 2015 issue of AnOther Magazine. In a work of fiction co-authored by Swinton, Glenn O'Brien, Luca Guadagnino, and Dave Kajganich, Marianne Lane gave an interview for the magazine based around events in the film. The first international teaser trailer was released on 1 October 2015. The second trailer was released on 5 January 2016. The second clip from the film was released on 15 January 2016. Fox Searchlight released the first U.S. trailer on 10 February 2016. In February 2015, Fox Searchlight Pictures acquired U.S distribution rights to the film. The film made its world premiere at the 72nd Venice Film Festival on 6 September 2015. It was also selected to screen at the Busan International Film Festival on 2 October 2015 and at the London Film Festival on 9 October 2015. Lucky Red released the film in Italy on 26 November 2015. The film was released in the United Kingdom on 12 February 2016 by StudioCanal. It was released France on 16 April 2016. Originally scheduled to open in United States on 13 May 2016, it was pushed up to 4 May. For its theatrical release A Bigger Splash earned $2,024,099 in North America and $5,521,659 in foreign receipts for a total world box office gross of $7,545,758. A Bigger Splash received generally positive reviews from critics. On Rotten Tomatoes, the film has a rating of 90%, based on 175 reviews, with an average rating of 7.4/10. The site's consensus states: "Absorbing, visually arresting, and powerfully acted by an immensely talented cast, A Bigger Splash offers sumptuously soapy delights for fans of psychological adult drama." On Metacritic the film has a score of 74 out of 100, based on 36 critics, indicating "generally favorable reviews". ^ "A BIGGER SPLASH (15)". British Board of Film Classification. 11 January 2016. Retrieved 11 January 2016. ^ "A Bigger Splash (2016)". Box Office Mojo. Retrieved 22 November 2017. ^ Canova, Gianni (September 2015). "Luca Guadagnino, Tilda Swinton & Dakota Johnson". L'Uomo Vogue. Vogue Italia. Retrieved 2017-11-02. ^ "A Bigger Splash: Luca Guadagnino Interview". The Arts Shelf. 28 June 2016. Retrieved 15 September 2016. ^ "Venice Film Festival: Lido Lineup Builds Awards Season Buzz – Full List". Deadline. Retrieved 29 July 2015. ^ "Venice Fest Reveals Robust Lineup Featuring Hollywood Stars and International Auteurs". Variety. Retrieved 29 July 2015. ^ "First still of "A Bigger Splash": Matthias Schoenaerts, Tilda Swinton, Dakota Johnson and Ralph Fiennes". imgur.com. Retrieved 28 July 2015. ^ "Exclusive 'A Bigger Splash' Photos Show Tilda Swinton's Beautiful Calm Before The Storm". indiewire.com. September 5, 2015. ^ "Watch: First Clip From 'A Bigger Splash' With Tilda Swinton, Dakota Johnson, Ralph Fiennes & Matthias Schoenaerts". The Playlist. September 5, 2015. ^ "Tilda Swinton Covers AnOther Magazine, But Not as Herself". observer.com. September 9, 2015. ^ "AnOther Magazine A/W15: Real/Unreal". AnOther Magazine. September 10, 2015. ^ "A Deeper Dive Into A Bigger Splash". indiewire.com. September 10, 2015. ^ "A BIGGER SPLASH – OFFICIAL TEASER TRAILER". YouTube. October 1, 2015. ^ "A BIGGER SPLASH – New Official Trailer". YouTube. January 5, 2016. ^ Kryiaziz, Stefan (15 January 2016). "WHY on Earth is Ralph Fiennes doing karaoke? WATCH the hilarious video here". Express.co.uk. Retrieved 21 January 2016. ^ "A BIGGER SPLASH: Official HD Trailer". YouTube. February 10, 2016. ^ D'Alessandro, Anthony (19 February 2015). "Fox Searchlight Takes 'A Bigger Splash'". Deadline Hollywood. Retrieved September 20, 2015. ^ "72nd Venice International Film Festival Screening Schedule – A Bigger Splash". labiennale.org. Archived from the original on 8 August 2015. Retrieved 12 August 2015. ^ "Luca Guadagnino's 'I Am Love' Follow-Up 'A Bigger Splash' Leads Our Venice Film Festival To-Sees". indiewire.com. July 29, 2015. Retrieved August 12, 2015. ^ "Two Matthias Schoenaerts' movies at Venice Film Festival". deredactie.be. 30 July 2015. Retrieved August 12, 2015. ^ "Venice Festival: Dakota Johnson, Matthias Schoenaerts to Pull Double Duty". The Hollywood Reporter. 29 July 2015. Retrieved August 12, 2015. ^ "BIFF 2015 Gala Presentation – A Bigger Splash". biff.kr. Retrieved 5 September 2015. ^ Davis, Edward (1 September 2015). "BFI London Film Festival Adds 'Steve Jobs,' 'A Bigger Splash,' 'High-Rise,' 'Black Mass' & More". Indiewire. Retrieved 20 September 2015. ^ "2015 BFI London Film Festival – Love Gala – A Bigger Splash". whatson.bfi.org.uk. Retrieved 5 September 2015. ^ Jagernauth, Kevin (1 October 2015). "Watch: First Trailer For Luca Guadagnino's 'A Bigger Splash' With Tilda Swinton, Matthias Schoenaerts, Ralph Fiennes & Dakota Johnson". Indiewire.com. Retrieved 21 January 2016. ^ "A Bigger Splash". OptimumReleasing.net. Retrieved 21 January 2016. ^ "SORTIES SALLES FRANCE 2016–2017 – Studiocanal" (PDF). StudioCanal (in French). 20 January 2016. Retrieved 4 February 2016. ^ McNary, Dave (1 September 2015). "Tilda Swinton's 'A Bigger Splash' Set for May Release". Variety. Retrieved 20 September 2015. ^ Murthi, Vikram (29 April 2016). "'A Bigger Splash' Exclusive Images: See Tilda Swinton, Ralph Fiennes, And More Vacation On An Italian Island". Indiewire.com. Retrieved 3 May 2016. ^ "A Bigger Splash (2016)". Rotten Tomatoes. ^ "A Bigger Splash reviews". Metacritic. ^ Warren, Matt (November 22, 2016). "2017 Film Independent Spirit Awards Nominations Announced!". Independent Spirit Awards. Retrieved November 22, 2016. ^ Vlessing, Etan (December 12, 2016). "'Moonlight' Named Best Film by Toronto Film Critics". The Hollywood Reporter. Retrieved December 12, 2016. ^ "LIVE: The winners of the 72nd Venice Film Festival". Retrieved 12 September 2015. This page was last edited on 4 January 2019, at 22:42 (UTC).